Dayyan and printer of Amsterdam; born 1672; died 1762. It appears from his epitaph (Mælder, "Jets over de Bergraafplaatsen," p. 15) that Frankfurter assumed in his old age the name of "Aaron." In 1720 he established a printing-press at Amsterdam, from which he issued some of his own works. He was the author of: "Nefesh Yehudah," a commentary on Isaac Aboab's "Menorat ha-Ma'or," with a Judæo-German translation (Amsterdam, 1701); "Zeh Yenaḥamenu," a short commentary on the Mekilta (ib. 1712); "Sha'ar Shim'on," prayers for the sick, a compendium of his father's "Sefer ha-Ḥayyim," in two parts, the second in Judæo-German (ib. 1714); "Sheba' Petilot," the moral teachings of the "Menorat ha-Ma'or," in seven chapters (ib. 1721); "Ṭob Leket," glosses to the Hilkot Semaḥot of the Shulḥan 'Aruk, Yoreh De'ah (ib. 1746); "Be'er Heṭeb," glosses on Shulḥan 'Aruk, Ḥoshen Mishpaṭ, similar to those of Judah Ashkenazi on the three other parts of the Shulḥan 'Aruk (ib. 1749). 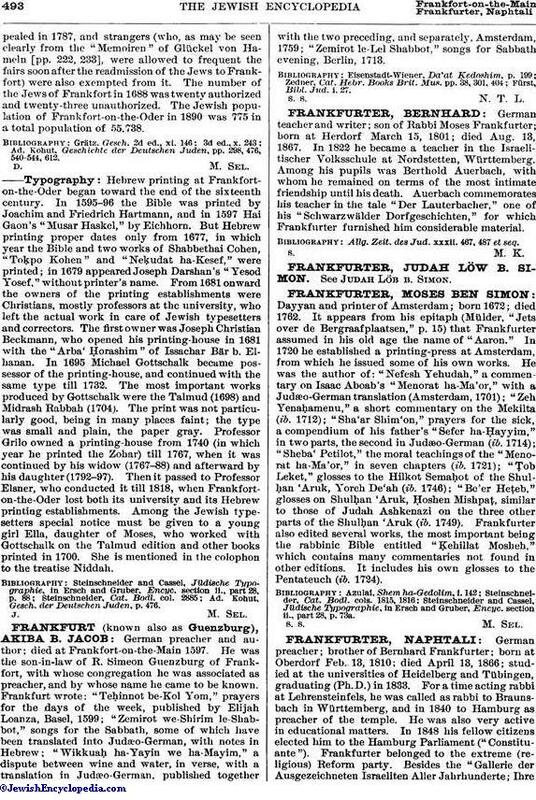 Frankfurter also edited several works, the most important being the rabbinic Bible entitled "Ḳehillat Mosheh," which contains many commentaries not found in other editions. It includes his own glosses to the Pentateuch (ib. 1724). Steinschneider and Cassel, Jüdische Typographie, in Ersch and Gruber, Encyc. section ii., part 28, p. 73a.